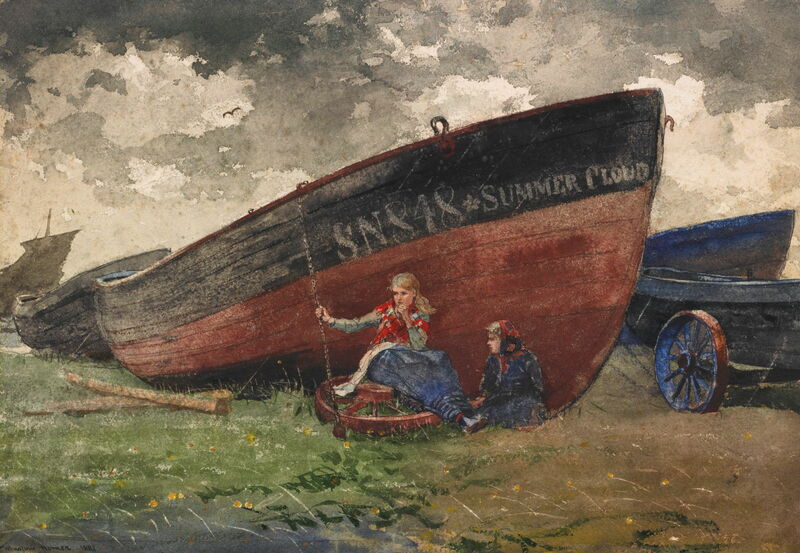 This short series has been looking at Winslow Homer’s paintings from Cullercoats. Life in fishing communities was centred on when the boats came in: the return of the men and boys, hopefully with large and valuable catches which could be sold to pay the bills and feed the family. Just as the women were responsible for watching for the return of the boats, so they knew that they had arduous work to do when they did come in. You can hear the song sung here, although that version has variant lyrics which were used as the theme for a British TV series of the same name. 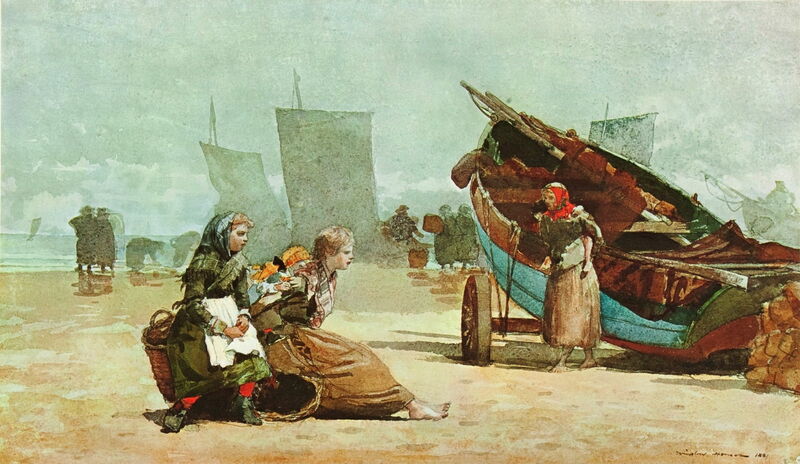 Homer’s Fisher Girls on the Beach, Cullercoats (1881) shows the arrival in progress, the earliest of the cobles being surrounded by their families, but the two fishwives in the foreground still waiting for their boat to come in. Although the boats were usually kept in and around the small harbour, when conditions allowed they would normally be sailed onto the beach, to allow better access to remove the catch and carry out maintenance. Winslow Homer (1836–1910), Fisherfolk on the Beach at Cullercoats (1881), watercolor and graphite on paper, 34.13 × 49.37 cm, Addison Gallery of American Art, Andover, MA. Wikimedia Commons. By the time that the last vessels were arriving, the whole beach was bustling with the fishermen and fishwives hard at work. The catch had first to be transferred from each boat into the large wickerwork baskets, then the baskets carried by teams of women from the beach up into the village to be prepared for sale. 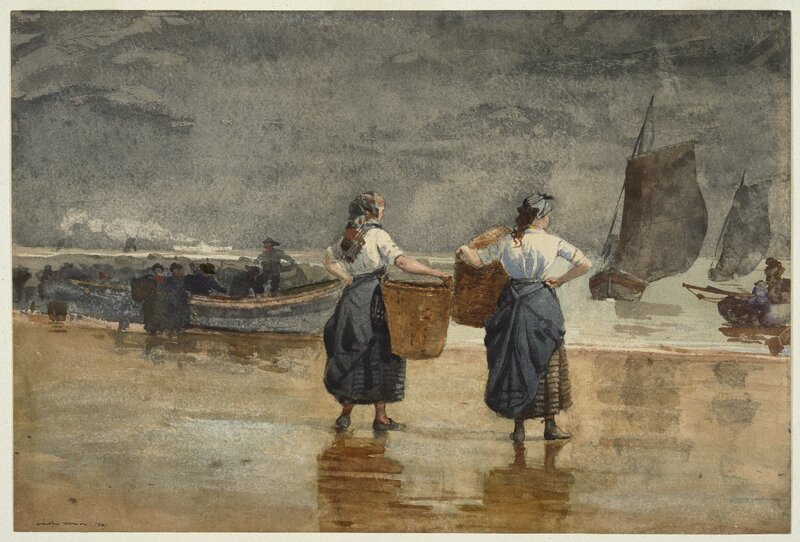 Winslow Homer (1836–1910), Four Fishwives on the Beach (1881), watercolor and graphite on wove paper, 40.64 × 58.42 cm, National Gallery of Art, Washington, DC. Wikimedia Commons. Four Fishwives on the Beach (1881) appears to have been one of Winslow Homer’s studies, probably painted en plein air using four models. Although he had a couple of wooden manikins dressed in miniature costumes, he seems to have worked as much as possible from life. 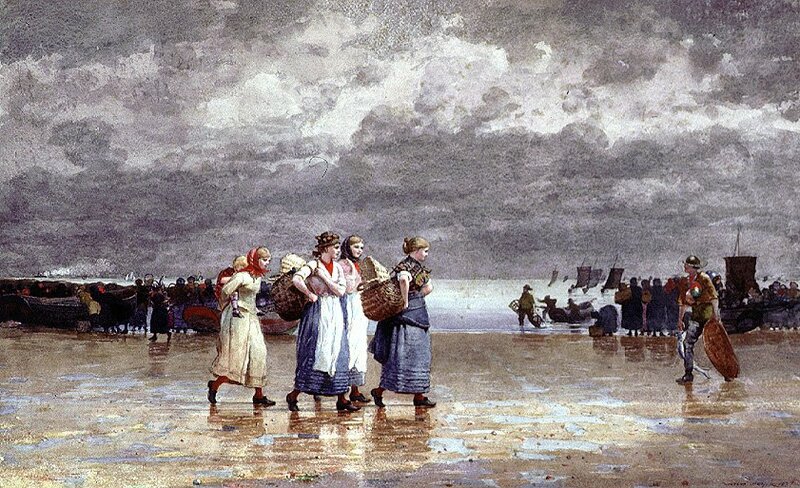 His Four Fishwives (1881) shows a finished version, worked into a moodier background, with sunlight illuminating the four women. Winslow Homer (1836–1910), On the Sands (1881), watercolor and gouache with pen and black ink over graphite, 33.7 × 47.8 cm, National Gallery of Art, Washington, DC. Wikimedia Commons. On the Sands (1881) is another quick atmospheric sketch started using pencil and completed in watercolour. 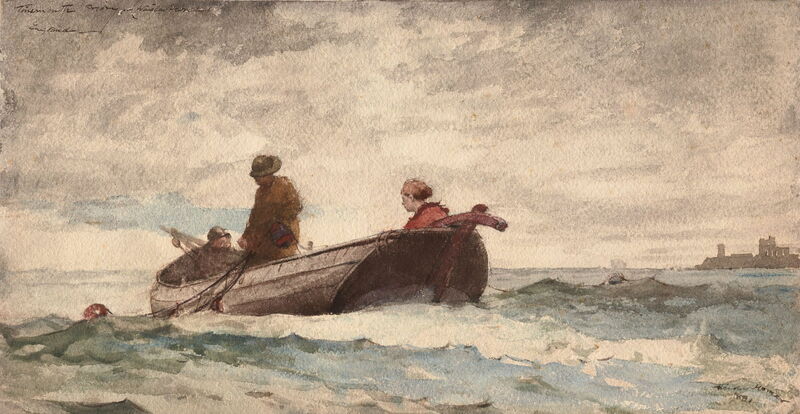 Winslow Homer (1836–1910), The Return, Tynemouth (1881), transparent watercolor, with touches of opaque watercolor, rewetting, blotting, and scraping, heightened with gum glaze, over graphite, on moderately thick, moderately-textured, ivory wove paper (left and lower edges trimmed), 34.2 × 34.3 cm, Art Institute of Chicago, Chicago, IL. Wikimedia Commons. 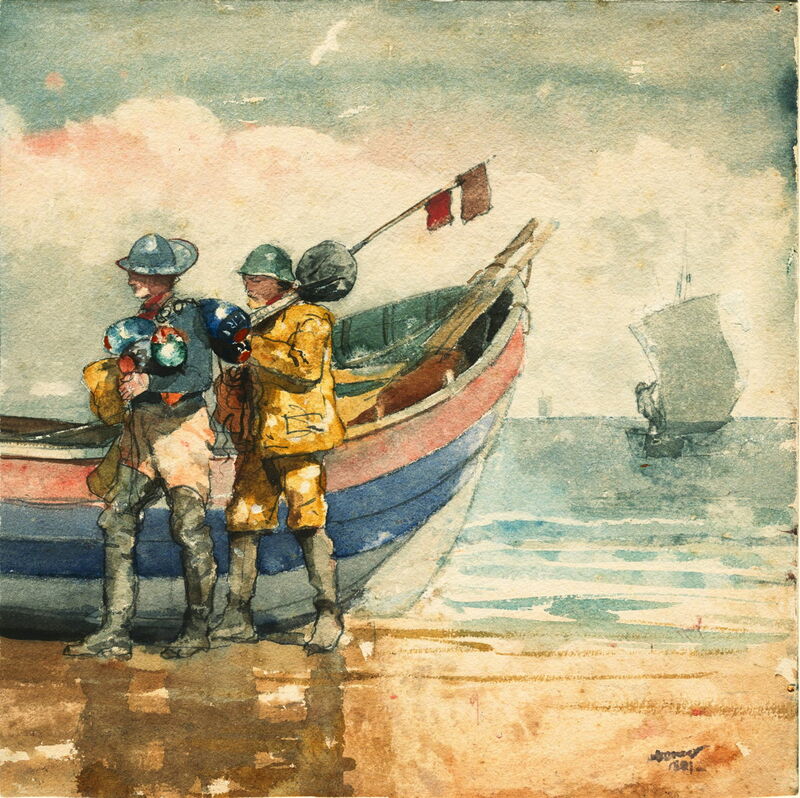 Most of these paintings continued to focus on the women, his most readily available models, but The Return, Tynemouth (1881) is a quick plein air sketch of two of the fishermen, with their brightly coloured oilskins, and carrying some of their gear. 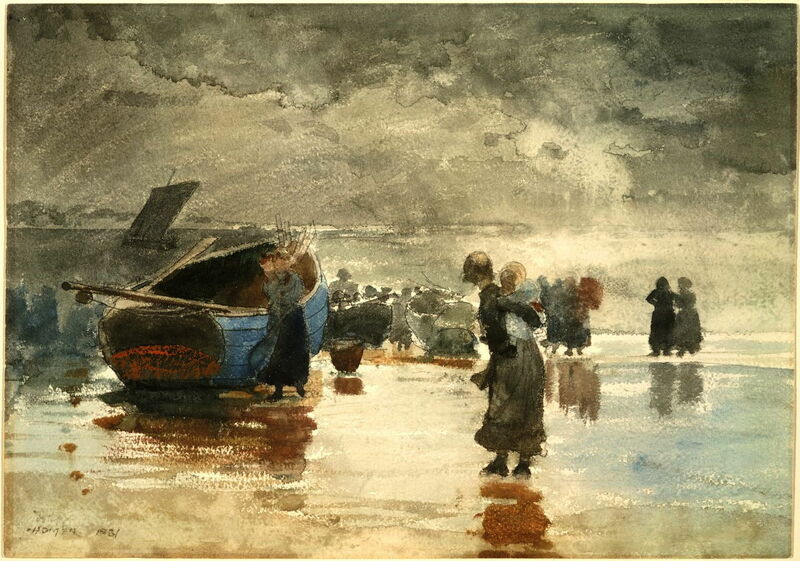 Winslow Homer (1836–1910), Beach Scene, Cullercoats (1881), watercolor over graphite on cream-colored wove paper, 29.1 × 49.5 cm, Sterling and Francine Clark Art Institute, Williamstown, MA. Wikimedia Commons. 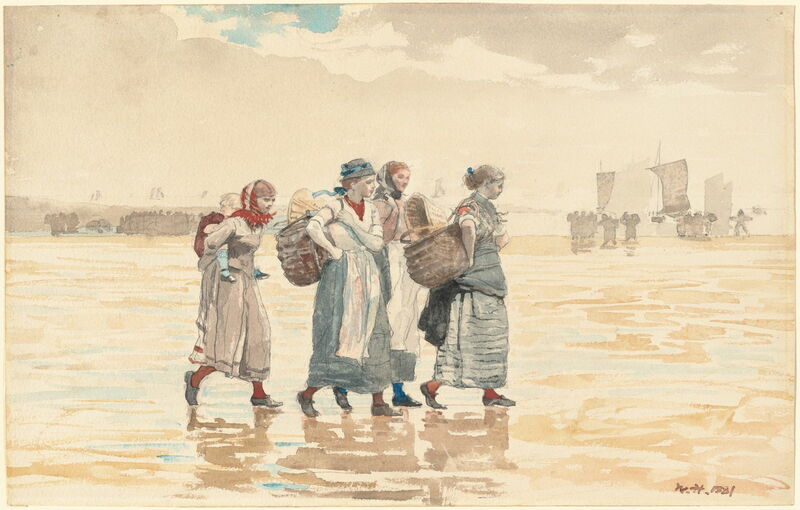 In fine weather the beach became the centre of the community, allowing Homer to paint portraits showing family life – again almost entirely of the fishlasses and fishwives. The Summer Cloud appears to be out of commission, perhaps awaiting repairs. Its registration number, painted by the name, indicates that it was registered in North Shields, which was the nearest major port to Cullercoats, at the mouth of the river Tyne. It is also likely that fish caught by local fishermen would have been taken by cart for sale at the large fresh fish market in North Shields, just over 2 miles away. This served the nearby industrial city of Newcastle-upon-Tyne. 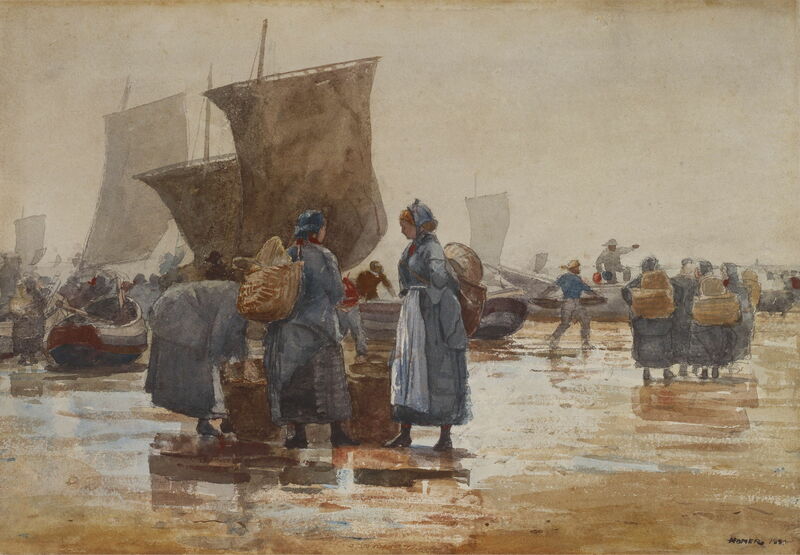 Winslow Homer (1836–1910), Tynemouth Priory, England (1881), transparent watercolor, with traces of opaque watercolor, rewetting, blotting and touches of scraping, over graphite, on thick, rough-textured, cream wove paper, 26.2 × 50.5 cm, Art Institute of Chicago, Chicago, IL. Wikimedia Commons. The last painting in this group is one of Homer’s most enigmatic. Known as Tynemouth Priory, England (1881), the priory of the title is seen in silhouette on the horizon at the far right, hardly a dominant passage in the painting. Its motif is a boat, presumably from Cullercoats, hauling in its net. But the boat has no sail, so could only have been propelled by oars, which are nowhere to be seen. Stranger still is the apparent woman (with a bright red jacket and tied back hair) at the helm of the boat. The next article in this series will look at Homer’s paintings after he left Cullercoats, and the influence which this experience and its images had on him. Posted in General, Language, Painting and tagged Cullercoats, Homer, narrative, painting, Turner, watercolour. Bookmark the permalink.